Important: Supplied with 1 x DUAL DVB-S/S2 Satellite Tuners as standard (Twin Tuner) leaving a spare tuner slot for say another single or dual satellite tuner (DVB-S2) and/or a terrestrial/cable tuner DVB-T/C. VuPlus Duo 2 - The new flagship receiver from VuPlus. 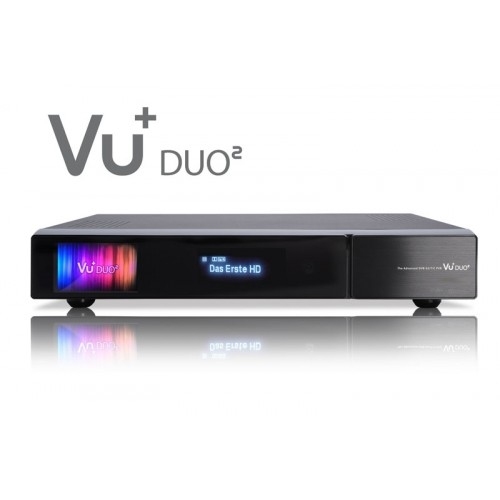 The Vu+ Duo² new features include improved connectivity to mobile devices such as notebooks, tablets and mobile phones. Thanks to the transcoding function, the gigabit LAN and the fast computational speed HDTV content can now be seen on all mobile iOS or Android devices. The built-in Wlan interface allows even inexperienced users to use network-based content such as HbbTV or streaming. Digital satellite receiver for digital TV and Radio programs. Support for up to 4 tuners if you buy 2 additional Twin Tuner Plug and Play Modules providing enough room to satisfy even the most demanding user. The main feature is the strong 1300 MHz Dual Core processor VU+ Duo2. Experience high definition TV with your VU+ Duo2. Noise Level 12 dB max. Click the button below to add the Vu+ Duo2 Full HD 1080p Dual DVB-S2 Twin Tuner Linux PVR Ready to your wish list.